With a stay at Premium Apartment Naschmarkt in Vienna (Margareten), you'll be convenient to Alphaville and Zoom. This apartment is close to Vienna State Opera and Schoenbrunn Palace.Rooms Make yourself at home in of the guestrooms, featuring kitchens with refrigerators and microwaves. Flat-screen televisions with cable programming provide entertainment, while complimentary wireless Internet access keeps you connected. Conveniences include desks and coffee/tea makers.Business, Other Amenities A roundtrip airport shuttle is provided for a surcharge (available 24 hours). Located in Vienna (Neubau), Ruby Marie Hotel is within a 15-minute walk of Wiener Stadthalle and Raimund Theater. This hotel is 1.7 mi (2.7 km) from Schoenbrunn Palace and 1.9 mi (3.1 km) from Hofburg Imperial Palace. With a stay at Hotel Admiral Wienna, you'll be centrally located in Vienna, just a 4-minute walk from Museumsquartier and 9 minutes by foot from Naschmarkt. This hotel is 0.7 mi (1.1 km) from Vienna State Opera and 0.7 mi (1.2 km) from Hofburg Imperial Palace. Featured amenities include dry cleaning/laundry services and luggage storage. 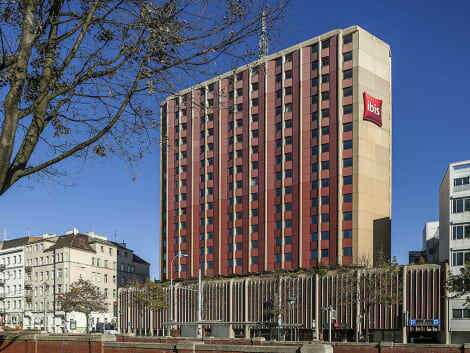 International flair and Viennese charm: the ibis Wien Mariahilf hotel is an excellent base for sightseeing (Big Bus and Blue Line tours), shopping, business and musicals. In a central location next to Westbahnhof train station and with many U-Bahn and tram routes nearby, you can quickly reach all the key destinations of this city on the Danube. 6 conference rooms, including 3 on the 13th floor with magnificent views, offer the perfect setting for events. Relax in our 341 modern, air-conditioned rooms.